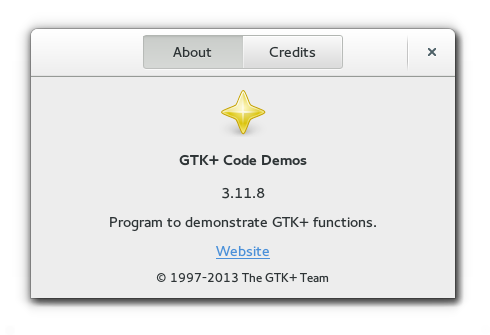 The GtkAboutDialog offers a simple way to display information about a program like its logo, name, copyright, website and license. It is also possible to give credits to the authors, documenters, translators and artists who have worked on the program. An about dialog is typically opened when the user selects the `About` option from the `Help` menu. All parts of the dialog are optional. About dialogs often contain links and email addresses. GtkAboutDialog displays these as clickable links. By default, it calls show_uri_on_window when a user clicks one. The behaviour can be overridden with the activate_link signal. 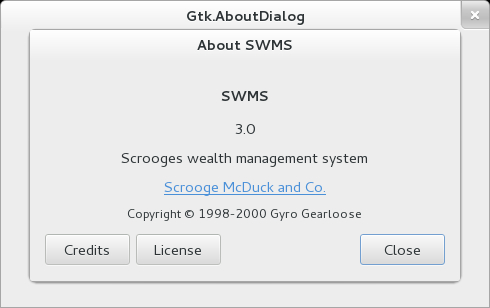 To make constructing a GtkAboutDialog as convenient as possible, you can use the function show_about_dialog which constructs and shows a dialog and keeps it around so that it can be shown again. It is also possible to show a AboutDialog like any other Dialog , e.g. using run. In this case, you might need to know that the “Close” button returns the CANCEL response id. dialog.documenters = null; // Real inventors don't document. dialog.translator_credits = null; // We only need a scottish version. The people who contributed artwork to the program, as a null-terminated array of strings. The authors of the program, as a null -terminated array of strings. The people documenting the program, as a null -terminated array of strings. The license of the program. A logo for the about box. A named icon to use as the logo for the about box. The URL for the link to the website of the program. Returns whether the license text in this is automatically wrapped. Sets the comments string to display in the about dialog. Sets the copyright string to display in the about dialog. Sets the license information to be displayed in the secondary license dialog. Sets the license of the application showing the this dialog from a list of known licenses. Sets the pixbuf to be displayed as logo in the about dialog. Sets the name to display in the about dialog. Sets whether the license text in this is automatically wrapped. The signal which gets emitted to activate a URI.